The whole of Southern Africa as a travel destination offers an holiday diversity not easily found on our planet. Filled with uniquely spectacular Game Reserves, National Parks, World Heritage sites, deserts, forests, wildlife, diverse tribal cultures and some very modern cities. Scenery ranging from majestic mountains, golden grass savannas filled with wildlife, wide open blue sky deserts, thick Acacia bush full of life and quiet sun-drenched beaches. Wildlife and spectacular scenery could easily be combined with vibrant cities such as Cape Town, Durban, Johannesburg, Victoria Falls and Windhoek. Each region and country with their own unique attractions and holiday seasons, ranging from botanical gardens, wine estates, museums, top golf courses and to numerous attractions to mention! Gateway Africa covers all Southern Africa's top tourist destinations, ranging from Namibia, South Africa, Botswana, Zambia and Victoria Falls. We also have a few safari vacations in Madagascar, Mozambique, Kenya, Tanzania and even further into Africa. Does not matter your destination, interest or budget, please feel free to talk to us. We will find your perfect African safari for you, or design your perfect trip around your interests, holiday time and requirements. 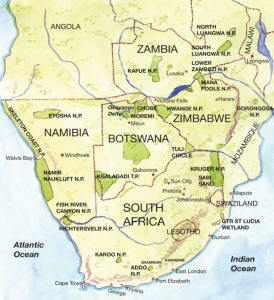 Taking the current economic situation in consideration, Southern Africa as safari and holiday destination, has opened up in the past few years, and now offers various very affordable safari travel options, ranging from comfortable tented camping safaris to all-inclusive mid-range lodge tours and top luxury lodge trips. With the above in mind: Namibia as safari destination, still offers the best value for money. Due to its spectacular natural diversity, peacefulness and value-for-money, Namibia will always be highly recommended by Gateway Africa. One of the most affordable ways of exploring Southern Africa is by going on a scheduled overland tented camping safari. These are quite affordable and full of adventure, but truly a spectacular way of exploring various Southern African destinations. Often multi-country in nature, but also could concentrate on a single country. Taking this in account, adventure camping safaris and their mid-range roomed accommodated up-grade options, has become very popular in Southern Africa. How to plan your African holiday? What to do in planning your African adventure or which destination to choose. There is no easy answer, as Southern Africa is an exceptional and diversified travel destination. It is all about your interests, requirements and naturally your budget. Camping safaris, and the various lodge upgrades to these, are the most affordable, with luxury lodge tours on the top end of the scale. "Always keep in mind, the value of your desired experience is a personal matter, and so is affordability."